Moose says, happy Wednesday friends. This is his model pose. He is giving you the puppy eyes. He’s really good at the puppy eyes. He also says not to make fun of his mom for the terrible title of this post today. She couldn’t quite get the creative juices flowing this morning. Yesterday morning I ran three miles before heading off to work. I was excited for lunch because we had work meeting which involved a lot of food. If you remember back on Valentine’s Day we had a red food themed lunch meeting when I brought the apple nachos. This time we had a St. Patrick’s Day theme and everyone was supposed to bring in a green food. Our work group tends to get pretty creative when it comes to our food. I sneaked a photo (don’t mind the terrible lighting) of the hodge-podge of goodness. 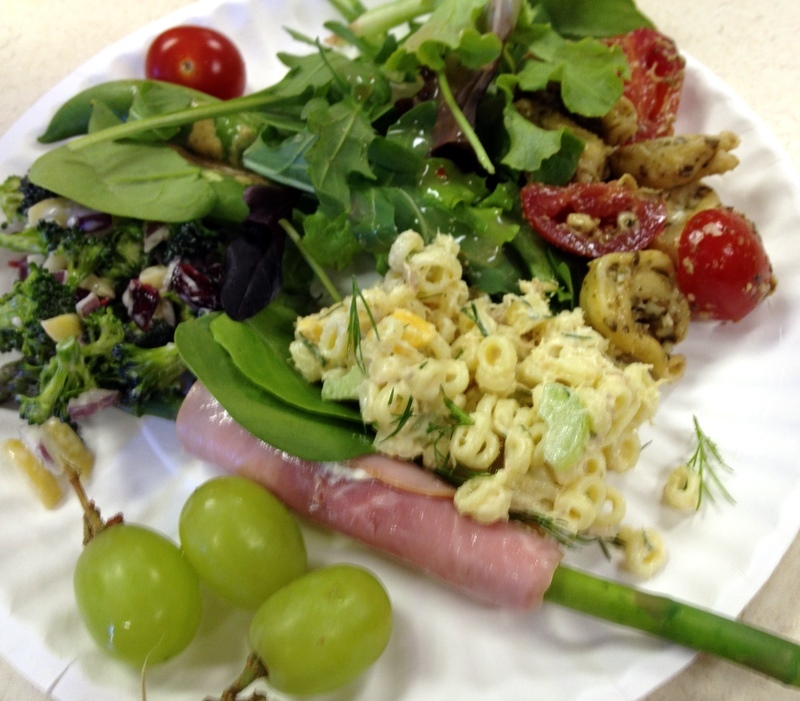 Mixed green salad, broccoli salad, tortellini salad, tuna salad, asparagus wrapped in ham and cream cheese, sugar snap peas, green grapes, and not pictured was split pea soup, green bread, and pistachios. What a healthy lunch right? I am always impressed by our group and our potlucks. I brought sugar snap peas with a peanut soy dipping sauce. I simply mixed peanut butter, hot water, and soy sauce. This sauce is really good for a topping on chicken lettuce wraps too. When I got home after work, this box was waiting for me on the kitchen table. 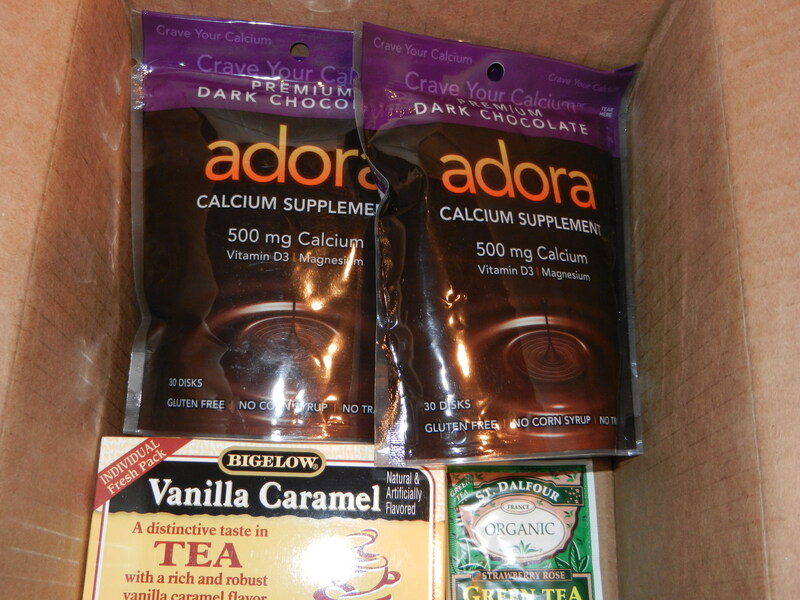 I ordered Dark Chocolate Adora disks from iHerb a couple of weeks ago and they have arrived. Adora disks are a delicious way to eat your calcium. I love the dark chocolate flavor but they also have milk chocolate. I NEVER forget to eat these babies. 🙂 I also ordered Bigelow Vanilla Caramel Tea because I thought it sounded good. It was an impulse buy. Why not? Now, guess what? Because I ordered products from iHerb.com, they want you to give them a try too. They offered a coupon code for me to share with friends and family. Enter the coupon code CIJ134 at check out when you order products at iHerb.com and you will receive $5 off your first iHerb purchase. Also, any U.S. orders over $20 receive free shipping! They offer a large variety of products on their site. I have been happy with them so far, so feel free to browse their site and see what you think for yourself. This morning began with a trip to the gym where I ellipticaled for 35 minutes while catching up on Runner’s World magazine. I have a stack of magazines piled to the ceiling so I took this opportunity to start cracking down on the pile. I really love reading magazines, it’s just finding the time that is sometimes the tricky part! Once I got home, showered up, I poured myself a tall mug of coffee and made a bowl of oatmeal. On the stove top I cooked 1/4 cup oats, 1/4 cup water, 1/4 cup almond milk, ground flaxseed, and cinnamon. I cooked this mixture until it began to thicken then added in about 1-2 Tablespoons of egg whites, gave it a stir, cooked for another 30 seconds and removed from heat. 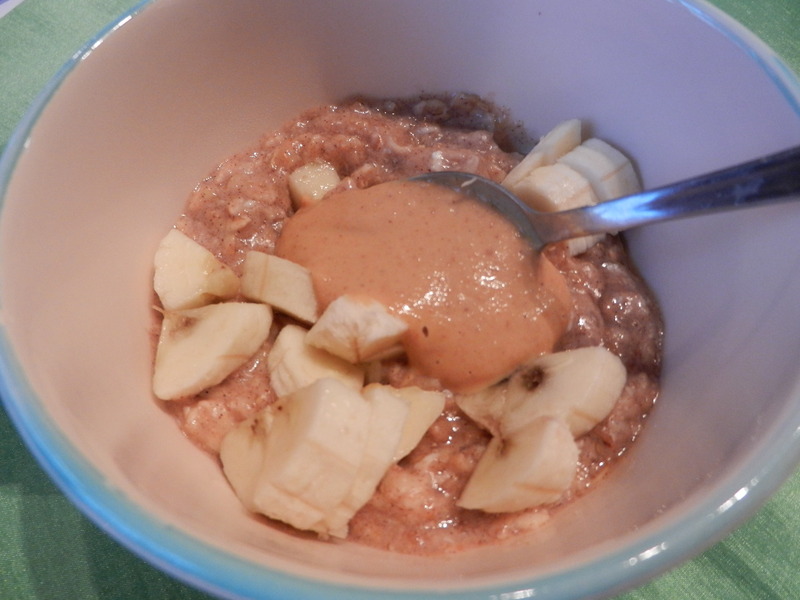 I poured the oats into my bowl and topped with PB2, bananas, and a tiny bit of maple syrup! Oh yea, that’s the stuff. I am off to finish getting ready for work, and pack my lunch. Have a great day! It is going to be beautiful outside. Wish I could be out there all day! I’ll leave you with a funny shot from last night. 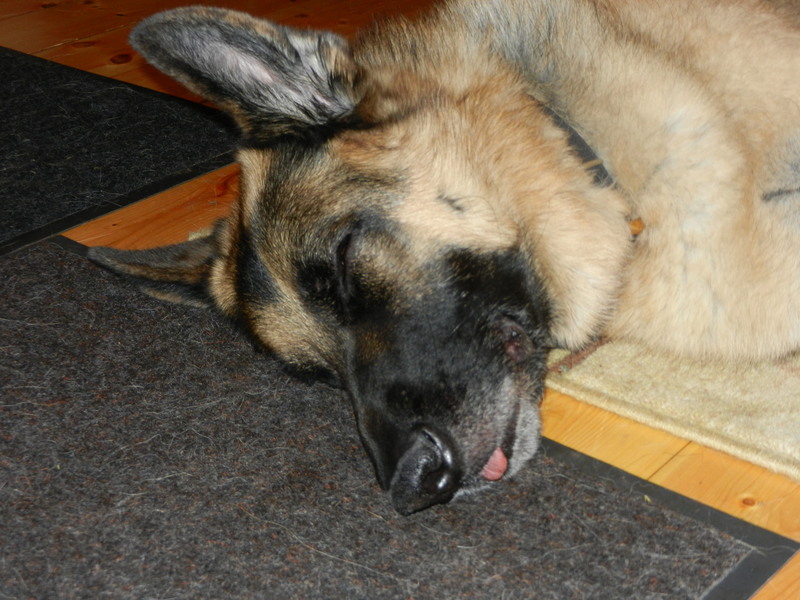 Moose was so exhausted he couldn’t even keep his tongue in his mouth while he slept. 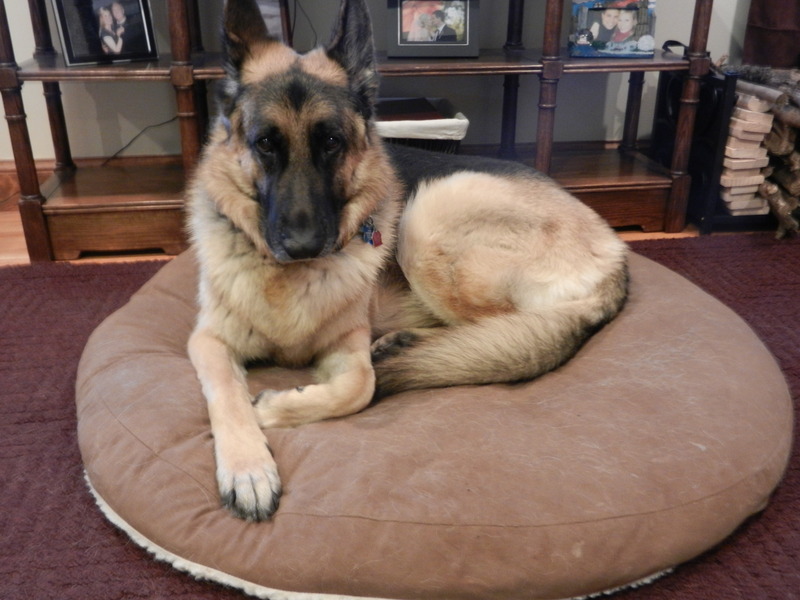 Awww…..it is a rough life, right Moose? You hang in there, buddy. 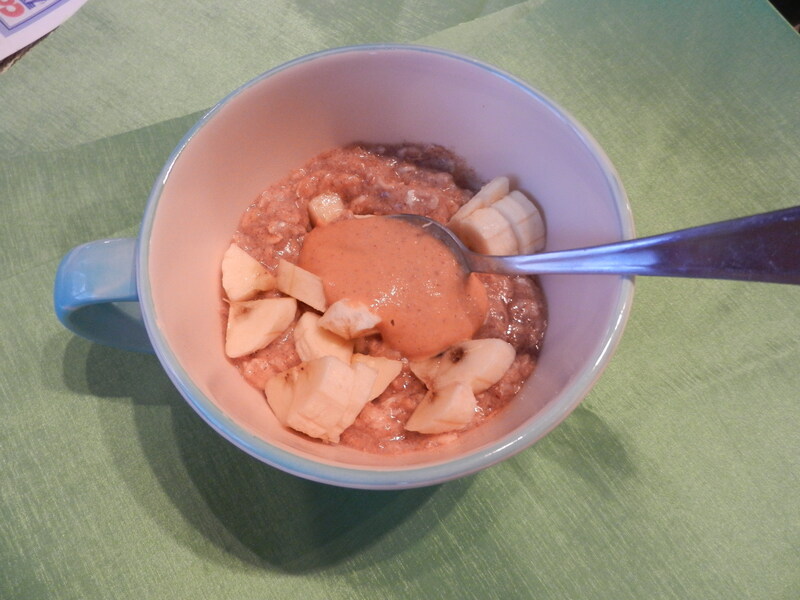 This entry was posted in Breakfast, Fav Products and tagged Adora Disk, healthy living, Oatmeal by Melanie. Bookmark the permalink. I hope you know you just absolutely made my day! Thank you so much Bex! Gimme Moose. Seriously. That (top) picture is adorable. Come over and see him ANYTIME!